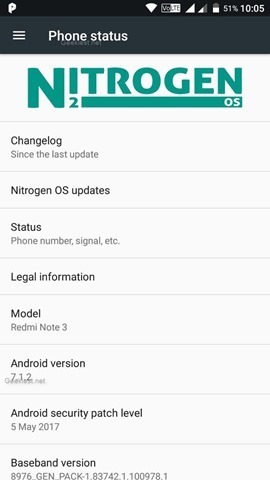 Xiaomi is taking its own time to update the Redmi Note 3 to Nougat. Actually, even if it does arrive MIUI will limit the features making it essentially useless. For example, MIUI does not allow you to customize the font styling in WhatsApp. On a normal Android OS, you can long press on text, and select Bold, Italic, etc. There are more reasons why you should opt for a custom ROM. Root, and in turn Adaway, Titanium Backup, Android Firewall + (AFWall+) for privacy management are some examples why you should. More control, more customization, etc. While LineageOS is good, we have had plenty of bugs affecting our daily usage, and would like to recommend an alternative ROM, Nitrogen OS. Besides working VoLTE, Camera, Flashlight and a stable performance, it has a lot of personalization options, and the developer options and root are pre-enabled. This ROM is for Kenzo, aka Redmi Note 3 (Pro) with the Snapdragon 650 processor. How to unlock the bootloader on Redmi Note 3 MIUI 7 and MIUI 8. If your phone’s bootloader is unlocked, you can follow this tutorial. Else, go to our previous article, to learn how to unlock the bootloader on the Redmi Note 3. 1. First download TWRP recovery for your unlocked Redmi Note 3. Put the file (rename the file to twrp.img) in the same folder as adb.exe and type “fastboot flash recovery twrp.img”. 2. Now, type “fastboot boot twrp.img”. This will boot the phone to TWRP. 3. Download the latest stable version of the Nitrogen OS ROM and the GAPPs file (we used opengapps pico). 4. In TWRP, go to mount and select MTP and copy the files to your phone. 5. Go back to the main screen in TWRP, and select install and select the ROM and Gapps file (in that order) and confirm the flash. 6. Wait for the phone to reboot, and enjoy the Freedom of Nougat on your Redmi Note 3. If your device is stuck in a boot loop, retry the above steps. If your device displays a message saying “encryption unsuccessful”. Do not panic. Simply boot to TWRP and select format > data. This will erase all contents in your internal storage. Refollow step 4, 5 and 6 and you are good to go.